Dundee Hawkhill Harrier Laura Muir feels well prepared for a tilt at Kelly Holmes' 1000m British indoor record in Birmingham on Saturday. Holmes' time of two minutes 32.96 seconds has stood since 2004, the year she won 800m and 1500m Olympic golds. "It will be tough, but I've everything going for me," said Muir, 23. "I'm in great shape, hopefully the pacing will be good for me, I'll have a home crowd and a quick track, so fingers crossed it will go well." Muir has broken two records already this year - the European 3000m indoor record and the British 5000m indoor record, the latter held for 25 years by Liz McColgan. Last summer, she broke Holmes' 1500m record at the Anniversary Games in London before beating her own time in Paris. She said of her 2017 feats: "I knew I was in great shape and it was just a matter of putting it on the paper. "We're still in the heavy training phase so hopefully by the summer I can sharpen up and be even quicker." Muir's coach Andy Young told BBC Radio Scotland on Friday that she has been "looking great in training this week" and "she is more than capable of going inside that mark". In fact, Young reckons if things go well his charge could even lower Maria Mutola's world indoor mark of 2:30.94. "Assuming that the pacemaker is spot on and the rest of the competitors don't trip her up, I'm pretty confident that she should be able to get inside the British record," Young said. "Looking at how fast she was going on Monday the world record might just be a possibility too. "It's a mark of confidence as to how well she's been going that it's something we thought she could do and that it would create a bit of excitement, letting the crowd get behind her. 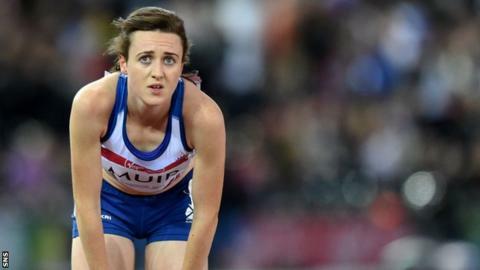 "She has already broken so many British records over the past six to eight months, I think it's realistic. If I didn't think she was capable of it I think we'd have kept it under our hats." Young emphasised that Muir's main focus this season is the World Championships in London, and the 23-year-old would clearly love to hit peak form at the place where she first took the 1500m record. "It was extra special when I broke the 1500m record for the first time because that was in the Olympic stadium with a home crowd," she said. "I still can't believe I ran that time; it's pretty crazy quick. I'm delighted with it. "To be racing there again at the London World Championships is going to be so exciting because the crowd is phenomenal." While Muir relishes targeting a record, medals remain her priority. "For me it's always the medals," she said. "Breaking records is great but you always want the medals to keep in that cabinet."